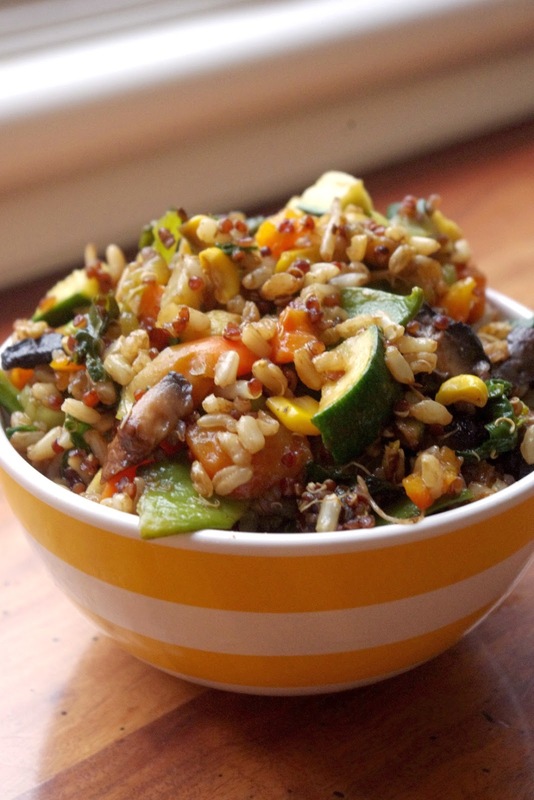 When I'm looking for a no-fail, healthy side dish I often default to my version of fried rice. Why 'Kitchen Sink'? Because, in terms of veggies, I generally add everything but the kitchen sink! 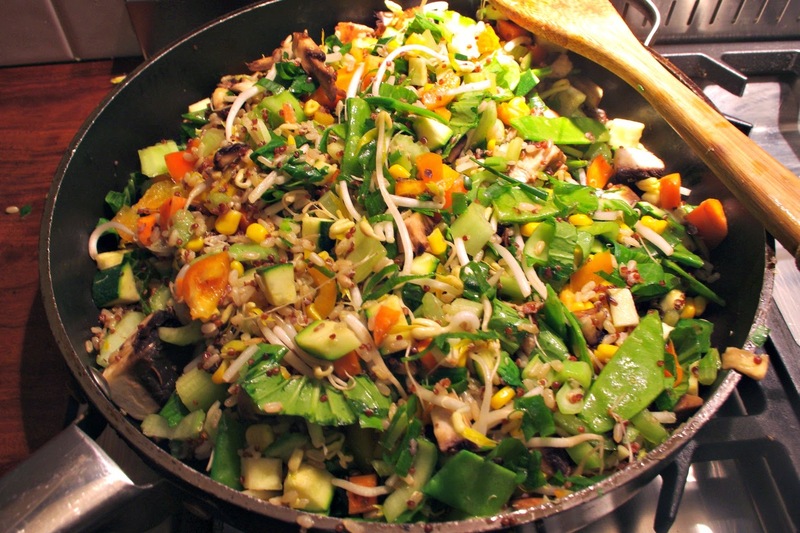 This version included carrot, celery, capsicum, zucchini, snow peas, bean sprouts, corn, pak choy and mushroom; other times I've also used broccoli, cabbage and/or peas. Use what ever takes your fancy, but I think the snow peas, pak choy and bean sprouts are essential to help capture a more asian flavour. As always this makes a large serve; the left-overs make for a great lunch. If you have the time, cook the rice earlier and allow it to cool in the fridge before cooking. It is even better if you can do this the day before, as this will dry the rice out and reduces the chances of making mushy rice. I suggest you make a double batch of rice and keep one in the freezer so you can make this in 10 minutes on a night you can't be bothered doing much more. 1. Add rice/quinoa blend to 2 cups of water with dried chilli and garlic powder in rice cooker and switch to 'cook'. When rice cooker has switched to 'warm', turn cooker off and leave lid on for a further 5 minutes. Cool rice in the fridge if you have time. 2. 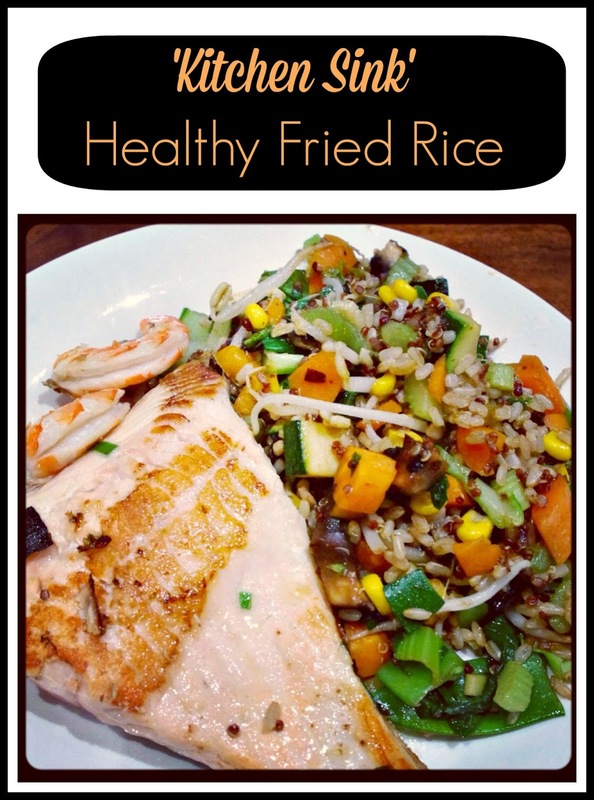 When rice is ready, add oil to your hot fry pan and cook rice for 3 minutes. Add garlic and ginger and cook for a further 2-3 minutes. 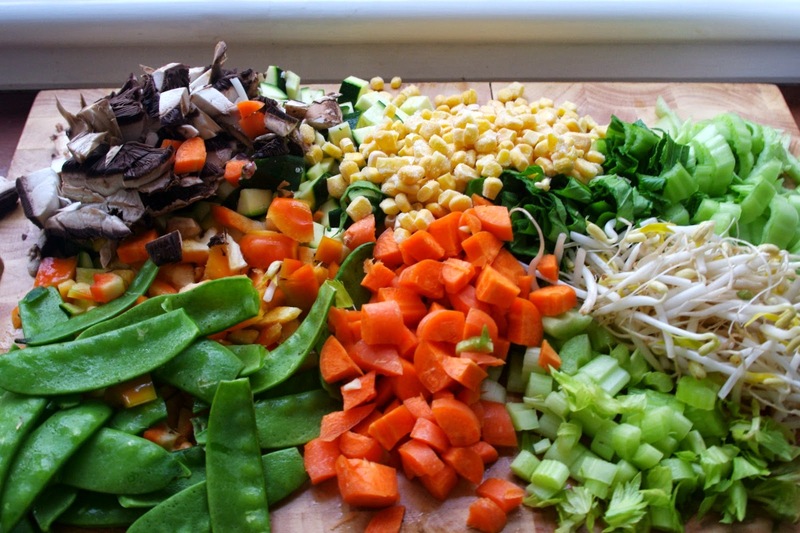 Start to add vegetables based on how long they take to cook i.e. start with carrot, celery and end with snow beans and bean shoots. 3. Add soy sauce to taste and finish with spring onions. Serve with your choice of protein or enjoy it as a meal in itself.